Have you ever imagine having a wall of wood, stone, brick, or concrete exposed as a unique accent in your home? If you want a unique wall, but at the same time do not want the complexity of caring for ornamental walls and walls exposed, you can use the realistic wallpaper. Realistic wallpaper is a type of wallpaper that looks like a certain material. When you touch it, you just realized that your eyes have been “deceived”. – Cover the plywood as area one of wall surface with patterned wallpaper with faux wood. 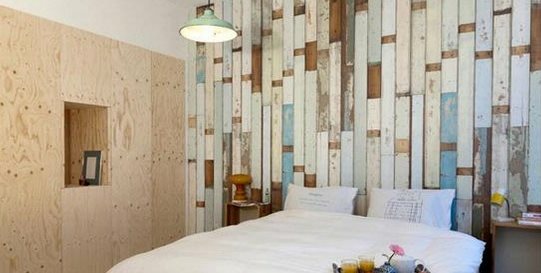 Attach the plywood on your wall, and feel a drastic change with the accent. – Wood patterned wallpaper also you can use in the back where you put your dishes. You can “peek” wood accents from the sidelines dishes. – Use wallpaper patterned concrete as a backsplash in your kitchen. Then, paint the entire kitchen with gray or black to make it look unique and industrial accents. Yet. kitchen make sure you get enough sunlight. – Set as wallpaper with wood pattern for a pedestal table. Cover with clear glass, and you soon have a “wooden table”. – Use wood patterned wallpaper to the ceiling of your room, and paint the wall around the room with a solid color.